I’ve slightly redrafted and expanded my thoughts on this opening episode. I’m also gearing up to tackle Series Nine – posts should start appearing at the end of next week. Benny Green (Terry Sue Patt) has the honour of being the first pupil we see entering the grounds of Grange Hill. Quite why he’s so early isn’t explained here – but it’s obvious from his opening scene that he lives for football. He’s also black and poor – which were both considerable disadvantages in late seventies Britain, but he’s always a positive character and never spends his time complaining about what he doesn’t have. Although this is a studio-bound episode, a generous application of water still manages to give the strong impression that it’s pouring with rain outside, as we see the likes of Fay, Annette, Julie, Jonah and Zammo all arrive looking decidely damp. Neither Mrs McClusky or Mr McGuffy have been used a great deal this year, so it’s nice to see them both and even better that they share a short scene together. It once again demonstrates the gulf between their approaches to discipline – Mrs McClusky is pondering exactly what measures she should take to punish those who truant on a regular basis, whilst Mr McGuffy gently suggests that if they do nothing then the situation mght resolve itself. Quite how this would work is never made clear, so for once it seems that Mrs McClusky is in the right. I love N2’s English lesson with Mr McGuffy. He announces that they’re going to study one of the greatest poems in the English language (to barely surpressed groans) and the stifled yawns we later see are a good indication that they’re not enjoying themselves. Mr McGuffy may be an inspirational teacher, but this isn’t one of his finest hours. This scene also demonstrates just how scruffy and run-down the corridors look. Possibly the sets have been gradually dirtied down, if so it’s a clever visual way of signifying that money at Grange Hill continues to be tight and the budget for decorating must be minimal. 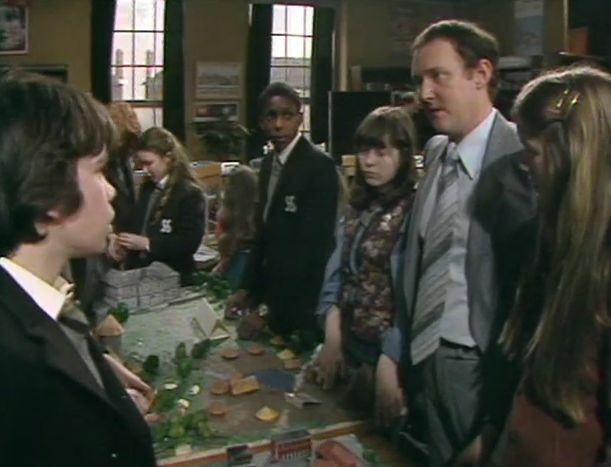 Mrs McClusky, together with Miss Mooney, Mr Browning, Roland and Annette, manages to get to the bottom of N2’s bullying triangle. Quite why she’s not taken any action against Gripper’s much more insidious racial bullying is harder to understand though. June Page makes a couple of brief appearances as Miss Hunt. One of Page’s earliest television appearances was as Chrissie in the rather fine Dixon of Dock Green episode Seven for a Secret, Never to be Told and she’d later pop up in numerous other series, such as Doctor Who. Roobarb and Custard – The Complete Collection. Simply Media DVD Review. Roobarb, which first aired in 1974, was one of a number of children’s series (The Magic Roundabout was another) which aired on BBC1 just before the six o’clock news, thus ensuring that it attracted a large adult viewership in addition to its intended target audience. This is probably the one of the reasons why it’s maintained a certain cult status ever since, although there are several others. Richard Briers’ narration is a major plus point as well. Briers was a master storyteller, and each five minute episode benefits enormously from his spot on comic timing. As good as the scripts are, Briers makes them just that little bit better. And lastly, Bob Godfrey’s unmistakable animation gave the series a look and feel unlike any other on television at that time. Although Godfrey wasn’t the only animator to work on the original (he tended to lead a core group of around four or five animators) every episode has the same hand-drawn feel which makes it seem as if it was the work of an individual. The animation style chosen, known as “boiling”, gave Roobarb a deliberately rough feel – as colour was crudely added with marker pens and varied from frame to frame. The minimalist style (despite the fact that most of the action took place in the garden, there was little attempt made to colour in the backgrounds – instead they remained a plain white) also helped to create a certain atmosphere. Of course this was no doubt borne out of necessity – the cruder the animation, the quicker it could be done – but thanks to the quality of Calveley’s scripting and Briers’ narration you can forgive the rough-and-ready nature of the visuals. As for the main character, Roobarb is terribly appealing. He’s an eternal optimist, always ready with an invention or a plan to make everyone’s life a little better. Things don’t always work out quite the way he intends though, and when disaster strikes he finds Custard the cat and the birds forming up to mock his efforts. But no matter, Roobarb always bounces back to hatch another scheme next time. Roobarb ran for thirty episodes which were repeated on numerous occasions. As with several other classic children’s shows it received a twenty-first century makeover and returned for another series, this time entitled Roobarb and Custard Too. Roobarb and Custard Too ran for thirty nine episodes, which were broadcast on C5 during 2005. As with the original, Grange Calveley provided the scripts and Richard Briers the narration, although this time the visuals were generated via computer animation (the “boiling” look of the original was kept). The opening episode, When There Was a Surprise, provides us with a clear example that this is a 21st Century Roobarb as it concerns Roobarb’s efforts to build his own computer (out of wood and other scraps) and how he’s able to get it working, courtesy of Mouse. Although the increased cast of characters in Roobarb and Custard Too slightly diluted the enclosed charm of the original, it was still a witty and entertaining series and whilst it’ll probably never surpass the original in many peoples affections it certainly has its moments. Roobarb and Custard – The Complete Collection contains, as its title implies, all thirty episodes of Roobarb (on the first DVD) and all thirty nine episodes of Roobarb and Custard Too (on DVDs two and three). Given that Roobarb and Custard Too was made in 2005, it’s slightly surprising that the picture format for all these episodes is 4:3. I don’t have a copy of the original broadcasts to hand, but I strongly suspect they would have been made in widescreen. It’s also a little disappointing that none of the discs are subtitled. Roobarb and Custard – The Complete Collection is released by Simply Media on the 16th of May 2016. RRP £34.99. Norris Karloff has posted what must be one of the best videos ever on YouTube, which sees the Crackerjack gang (Ed Stewart, Peter Glaze and Bernie Clifton) cover XTC’s song with hilarious consequences. For many of the first years, it’s the last time we’ll see them in school uniform as when series three opens, uniform has been made optional. Cathy and Trisha are given the job of designing a project about school uniform through the ages, which gives them an early chance to wear something a little more casual. There’s a nice bit of continuity as Judy Preston makes a reappearance. Along with a few of her classmates at Brookdale, she’s come to propose a quiz between Brookdale and Grange Hill. Mr Llewellyn agrees and this brings the series to its conclusion. It’s also the last time we’ll see Sean Arnold as Mr Llewellyn. Although Llewellyn remains headmaster for series three, he’s only ever referred to and never actually seen (after a while this becomes obvious – he’s always away at conferences or otherwise unavailable). And it won’t be the last time that Grange Hill will have a head teacher who’s conspicuous by their absence. There’s a bit of a kerfuffle at the quiz after Doyle and his friends lock Hughes (who’s dreading taking part anyway) in a cupboard. With the clock ticking down to the start, there’s a mild crisis when he can’t be found. It’s very mild, to be honest, as it’s hardly the most gripping of plots, but it fills a few minutes. The news that Mr Mitchell is leaving comes as a surprise, although Doyle (thanks to his family connections) already knew. But whilst teachers and pupils come and go, life at Grange Hill goes on. The end of year exams are fast approaching and Susi’s feeling the strain. Miss Summers later tells her that the first year exams aren’t terribly important, but Susi’s mother is putting considerable pressure on her. Next year she’ll be in the top set in French and English, but in a lower set in Maths. This comes as a disappointment to her (although it’s clear that it’ll be more of a disappointment to her mother). Miss Summers is able to explain that it’s no disgrace to be in a lower set in some subjects, it simply means that she’s not quite as good at Maths as she is in other subjects. Therefore it’s better that she’s placed in a set with others of a similar ability, rather than struggle along in a higher set. There’s a clear divide made between Mrs McMahon and Penny’s mother, Mrs Lewis. Mrs McMahon never seems to give her daughter any encouragement at all and also tells her that she’ll be voting to keep school uniform in the upcoming referendum. Mrs Lewis is a much more relaxed character (for example, she’s quite happy to vote for the abolition of uniform). The juxtaposition between the two mothers makes a telling point – if Susi didn’t feel her mother’s constant disapproval thenno doubt she’d be a much happier person. Mr McMahon (Bill Treacher) is more supportive, telling Susi she can only do her best, although he’s rather distant, which seems to make it clear that Mrs McMahon is the driving force of the family. This is Mr McMahon’s only appearance and it does come as a slight shock to see a rather well-spoken turn from Treacher (later to become very familiar thanks to his decade or so as Arthur Fowler in Eastenders). Elsewhere, Tucker finds an exam paper which he’s convinced is the one they’re about to sit. We’ll revisit this plot-line in later years when Pogo tries to make a profit by selling questions from a paper he found. Here, Tucker doesn’t attempt any such free enterprise – he’s happy to share for free – but it doesn’t take a mind-reader to work out that it’s clearly not going to end well. Mr Mitchell’s reluctance to act, although he knows that something’s going on, makes it plain that whatever Tucker’s found, it’s not that year’s paper. This is made quite obvious when none of the questions come up in the paper they take – resulting in poor Tucker suffering attacks from all of his angry classmates! The referendum to make school uniform optional votes in favour of the proposal by a narrow majority, to the delight of many. Although the boys make it back safely, there’s no sign of the girls – so a full-scale search is initiated. Justin wants to tell Mr Mitchell that they saw Penny and Susi in the forest, but the others aren’t keen as they know how angry he’ll be. So for the moment they all keep quiet. Apart from the natural dangers of the forest, an extra level of jeopardy is introduced when it’s revealed that a puma has escaped from a local wildlife park and is roaming around. Since we never see it (we’re told later that it’s been caught) it turns out to be something of a red herring, especially when there are other dangers – such as marshlands – which could be equally as dangerous. Eventually Justin decides to speak up – despite Doyle’s threats and this marks something of a turning point in Justin’s character. He’s always been portrayed as rather weedy (in the previous episode the coach had to stop as he was feeling sick, for example) but he stands up to Doyle here and threatens to smash his face in if he doesn’t stop complaining. Dramatically there’s not a great deal of tension during the search, since we can confidently assume that Penny and Susi are going to be found safe and well (a similar problem occurred in a later episode when Mr Baxter and Roland were lost on an outward bound course). But the hunt for the girls is quite effectively staged – especially when it gets darker. The only problem is that they presumably couldn’t afford to shoot at night, so instead a dark filter is placed over the camera to simulate the night-time ambiance. The dead giveaway is the fact that the blue sky can still be seen (an unavoidable side effect of day for night filming). 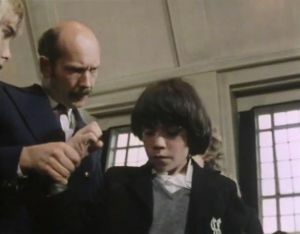 Mr Mitchell is all for punishing the boys when they get back to school but Miss Clarke (Jill Dixon) is much more forgiving, considering that if the trip was partly to teach the kids about the countryside, then they’ve certainly learnt how dangerous it can be. Her counsel wins the day and the pupils return to London a little wiser.